And now there are two puppies in our home. Meet Bear, Hank's brother. Isn't he darling? On Thursday I heard from the breeder Diane that there was one blond boy and black girl still available from the litter Hank came from. I was so surprised because I had never heard about another blond boy, I thought we had met all the puppies. She told me she thought I wanted the biggest dogs so she brought me the biggest puppies. I promptly told her I wasn't ready for another puppy, Hank was enough and was pouncing on Little Buddy every chance he got. Then she put the thought in my head that puppies usually bite each other and get tired playing so they don't bite their humans as much. Well played by her I think because then I kept thinking about that. Then I made the mistake of asking for a photo, oh my! Big brown eyes and a black nose, he looked so sad. Hank has big green eyes and a brown nose. Apparently they were pretty inseparable when they were together, an now that the other boys were gone he was whining a lot. Now how can I live with that? We talked, and I hemmed and hawed but in the end I know I would always wonder about this little boy. We sent her a text last night and he was still available. She was thrilled, well of course she was and even gave us a discount! I called Mr 20 and arranged for him to meet us at the breeders and we did that this afternoon. Bear is darling, a bit smaller than Hank for the moment and for now a little more subdued. That can all change when he gets used to us. Hank was soooooooo excited to see his brother. They smelled, and smelled, and circled, and Hank ran around and nibbled a bit on his brothers ears. Just call us puppy crazy here, I am afraid that is what we will be for a few months at least. But then they will calm down and everyone will be as happy as can be. I always wished Max had a friend, he would have been less sensitive and happier when we left him alone for a few hours. Now Hank and Bear will have each other. It's nice to have a sibling isn't it? Okay off to puppy duty, and it's raining out, bummer! That is so exciting to have TWO new puppies! They look so happy in the photos to be reunited. It will be so much fun to have them playing together and keeping each other company. I really love the dynamic at my parents house, they have two cats and I just got back from visiting them this weekend. It is so fun to see them chase each other and watch each other. I really think it is good for animals to have a friend. Enjoy!! I'm sure you will have so much fun with them and Buddy must be thrilled! I really do think adding another puppy is really a good idea! The puppy boys will play and tire each other out and that will give the human boy a chance to play but still have TWO best friends. You will survive! They are so darn cute! Omg!!! This is totally adorable!! And so something I would do! I'm right there with you when it comes to puppies. Bear is so cute and he looks like he has a big smile on his face now that he's reunited with his brother Hank. What fun you will all have and I'm thrilled to be able to read along with your puppy adventures. HA! My neighbor's breeder pulled something similar and they wound up with two also. So nice they are together - sounds like a bonded pair. Two dogs are fun but they are also challenging, as I am finding out. At least you have a matched set. Good luck! Oh my, it will be rough for awhile, but in the long run a good idea. 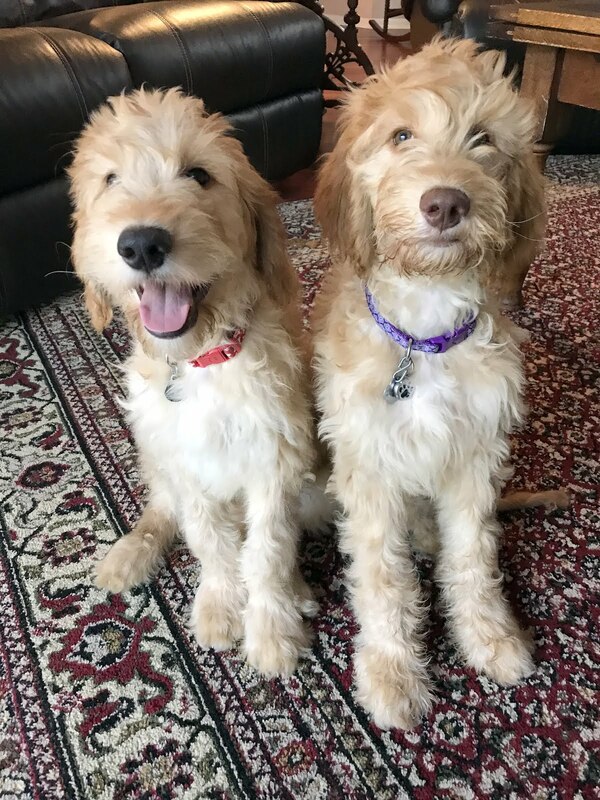 Now you have puppy brothers who are best friends. Buddy must be very happy. Your family looks like puppies are a great idea ! Hugs. Oh my goodness, they are too sweet together. I hope Buddy gets a little peace now, even if you get none ! How could you say no? But she's not wrong! Puppies and kittens always do better in pairs! Wonderful, Meredith! I think you did a smart thing, they will entertain and be good company for each other. I love the name, Bear:) Oh, you're going to have some fun now!! That is almost TOO MUCH cute! Congrats on the new family member. Ahh, those puppies are adorable! Beautiful photos! Such a lovely puppy! I have been contemplating on getting a puppy for years now; and I decided we should definitely have a pet in our new home but two?! You are my hero! Who could resist those beautiful eyes and face...he is gorgeous. A wonderful combination. and so is your blog. I don't comment often but I am always reading here. I love your little buddy and your sweet soul. have fun! and yes... those little needle teeth will need teething toys to chew on. helps the humans anyway. LOL! Twice as nice!! You have even more men in your life to love now and how good is that! So happy as always for you all because you are so lovely and seeing your happiness makes me so happy. Just jealous that I am not there for any doggy hugs! They are so cute together. They both are going to keep you all very busy and excited. How much I envy you! That is just wonderful, what a lucky puppy, he’s as adorable as his brother. I love all of the photos but the one with your boys is the best! This just becomes more and more adorable. Well done you for taking it all on. This is crazy but wonderful , too! What a happy picture of all of you! Lucky Buddy, he will have a head for each hand to rest upon once the pups have worn each other out. They are a lovely sight together. Mere, I think your decision is wonderful. I have always thought two dogs would help with the sadness when we have to leave them . I know many brother sister dog pairs and they all were wonderfully bonded. Oh my gosh. .I want to come over. Your boys with the dogs photo is amazing ! If I do it again ,it will be with a pair, be it kittens or dogs. You are in for so many laughs!! OMG! Bear's adorable! The brothers will be so happy to grow up together. Oh my goodness Meredith! What sweet, sweet boys you have. All five of them. :-) You can tell how much your family loves dogs and that breeder knew exactly what she was doing didn't she? I'm looking forward to watching them grow up with LB. He will be in absolute little boy heaven with two best friends. My goodness you are going to be busy. Now you just need one more dog and each of the three on the sofa can have a dog each. Off course it's usually mum who does the true looking after. They are adorable. It is fatal to look. That's why I resist looking at kittens. I know you will enjoy them, big dirty paws and all. Oh my, Mere! I'm not sure if you are more crazy or compassionate! I think you are right that the craziness will wind down, and then puppies and LB will settle into a happy life together! Wow.Two puppies.Hope the theory that they will nip each other and not Little Buddy works out.Lovely photo of all your boys. Oh, Mere...these pups are so cute! How sweet that they are brothers. You must have a truckload of energy with all that you do. Who takes care of the dogs while you're at work...are your older boys at home now? Adorable!! I think it really helps to have two, as they can stand each other's energy level without driving everyone else crazy. Welcome, Bear! OMG YOU HAVE TWO PUPPIES!!!!!! You guys are puppy crazy! But I am so happy and excited for you! I loved reading about the brother's reunion. It is lovely that Mr20 was able to join you for the addition of Bear. Aww. It's all so cute, I want to hug something! Hug your boys and your furry boys too, for me. I think it's fabulous. Your logic makes complete sense to me and I have one boy and no animals! Was it really true? Can I believe what my eyes are seeing? Two beautiful blonde puppies? Indeed! Congratulations, Meredith! Welcome Bear! He looks very sweet. When those brothers were happy to see each other, well, you know you have done the right thing. Will they still pay as much attention to LB? I hope Hank will introduce Bear to Little B and tell Bear what a great playmate LB is. The three amigos! Ha! That breeder knows her customers! But I am happy for both Hank and Bear and for Lil Buddy too to have double the love. FYI, you're not alone-- my daughter ended up with TWO Bernese mountain dogs. That's A LOT of dog in the house! Hank and Bear are precious, Mere. I think you are on the right track, I think two critters will keep each other company. It may be more work, but I think you have the warmest heart and will roll with it. Love and hugs, and a kiss on the cute cheeks of Little Buddy! Oh my gosh, you did it! I can sure see why Bear stole your heart. I guess you won't be bored any time soon, eh? Enjoy! Awwww...you have such a big heart Meredith! Awww, how cute they are!